Sen Edward Markey ’72 vows to continue the fight to protect consumers. 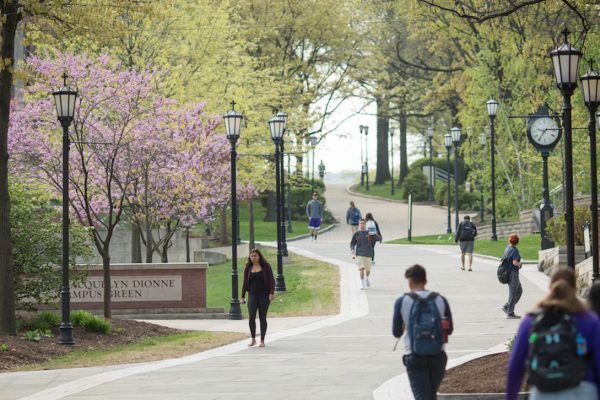 Calling upon Boston College Law School students to rise to civic duty, US Senator Edward J. Markey ’72 invoked the spirit of Boston College Law School in defense of the common person through education. 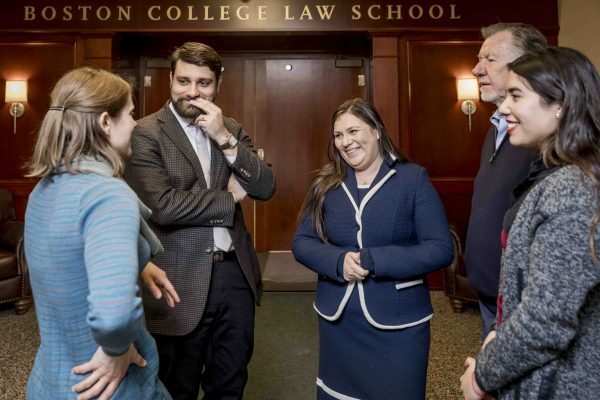 Markey, a Double Eagle, shared his story and views as part of a special speech presented by the Rappaport Center for Law and Public Policy and the Dean’s Distinguished Lecture Series. 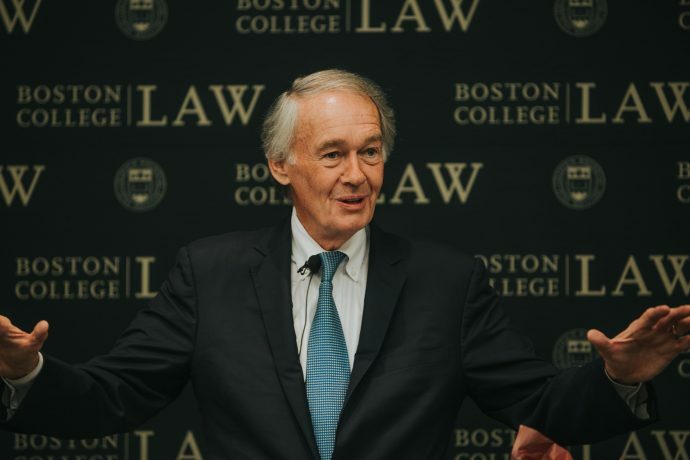 “I see my job as working to protect the public interest as a Boston College-trained United States Senator,” Markey said. Raised by his mother and father—a milk man—in a blue collar household in Malden, Markey developed humanistic values and a strong appreciation for the environment. 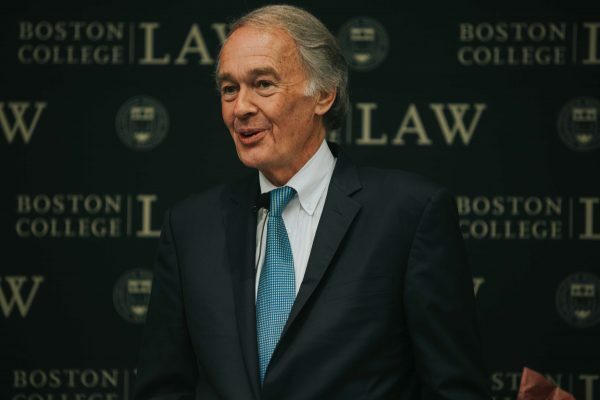 Markey’s speech began with cherished nostalgia for the campus and faculty who taught him to “make comfortable the afflicted and afflict the comfortable.” His attention soon turned to the ongoing war on the ‘fourth branch of government”—administrative agencies—by the Trump Administration. Markey stressed to students both the threat to the federal agencies that protect the health, safety, and welfare of Americans and the role lawyers will have to play in the oncoming court battles over the regulatory bodies charged with enforcing these regulations. “Up until the 1980’s, regulation was not a dirty word,” the Senator said in comparing the practices of Presidents Donald Trump and Ronald Reagan. Markey stressed the importance of regulations “that kept our air and water clean, our financial market sound and stable, and our consumers protected from dangerous products and predatory practices.” These regulations, Markey noted, are under pressure through a three-prong attack reminiscent of Ronald Reagan’s mass deregulation during his presidency. Markey explained his perspective of history repeating itself through Trump’s administration. Markey argued that President Trump is using Reagan’s former tactics to destroy federal agencies responsible for executing regulatory laws. Markey elaborated on Trump and Reagan’s use of appointing “foxes to guard the henhouse,” where federal regulatory agencies, like the Environmental Protection Agency (EPA) or Department of Energy, are led by officials who want to dissemble their own agencies from within. Markey described the “grim reaper” tactic of restraining new legislature, such as Trump’s “two for one deal” to cut two regulations for every one passing through the legislature, and starving federal agencies of money and resources, rendering them inert. This presents a problem today, Markey said, citing as an example the revocation by the Congressional Review Board of several regulatory laws concerned with public health and welfare, such as labor abuse reporting and mine waste dumping. Even with the future of multiple federal agencies in question, the Senator asserted that there is still hope. He said the legal battles that challenge Trump’s executive orders and fight the dismantling of American regulation are the last line of defense. “It will be the lawyers who ultimately have to stand up and take each and every one of the decisions to court to block and to prevent the harm which will be done,” he said. To read additional coverage of Markey’s talk, click here.